Msgr. George Tomichek, a priest of the Diocese of Calbayog in the Philippine Islands but stationed in Philadelphia where he ministered to the Filipino, Spanish and Mexican communities, died March 26. Born in Philadelphia, the son of the late George and Helen Tomichek, he attended St. Peter the Apostle School and Northeast Catholic High School, from which he graduated in 1960. Although he studied briefly for the priesthood either as an Oblate of St. Francis de Sales or as a Philadelphia archdiocesan priest, he put it aside and taught at Northeast Catholic High School in the mid-1970s, according to Oblate Father Thomas Gallagher, a fellow teacher and friend ever since. He also continued theology studies and received his degrees on his own, during this period. He had a lifelong devotion to St. John Neumann who is enshrined at St. Peter’s, and this indirectly led to his eventual ordination to the priesthood. He was at a Serra International Convention in Philadelphia in 1976 manning a booth to promote the cause of Bishop Neumann, where he struck up a conversation with Bishop Felix Zafra who was from the Diocese of Dipolog in the Philippines. The bishop not only convinced to him to again consider the priesthood, but consider becoming a priest for his own Philippine diocese, Father Gallagher recalls. Bishop Zafra accepted his theology degrees in lieu of formal seminary training and within a matter of months ordained him May 29, 1976 at St. Peter the Apostle Church as an incardinated priest of Dipolog Diocese. At the direction of the bishop Msgr. Tomichek stayed abroad to promote the Philippine missions and to assist expatriate Filipinos and also conduct the annual Bishop’s Appeal. During a period when he was staying in Rome he did some translation from Polish to English for Pope John Paul II, and this led to his being named a monsignor. He was so esteemed in the Philippines that he was shortly after promoted to Protonotary Apostolic, the highest degree of monsignor, which is so rare at this time that there are none in Philadelphia. Imelda Marcos, former first lady of the Philippines, sang the Ave Maria at the celebration following his investiture, according to Father Gallagher. 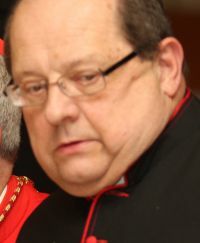 Philadelphia and St. Peter Parish were his home base for most of his priesthood, and since the 1990s he had been incardinated to the Philippine Diocese of Calbayog. The ordinary of that diocese, Bishop Isabelo Abarquez, will come to Philadelphia for the funeral and will be celebrant of the Friday, April 4 evening parish Mass for Msgr. Tomichek. Other than his work among the Filipino community, Msgr. Tomichek will be best remembered for his fidelity to St. John Neumann. He was present when Bishop Neumann’s body was exhumed as part of the canonization process. The vestments that that were placed on the remains before they were placed in the glass coffin under the altar at St. Peter the Apostle Church were made by Bishop Tomichek’s mother. He was also present in 1989 when new vestments were placed on the body. In 2007 when another set of vestments true to the style and fabric worn during St. John Neumann’s time were placed on the body, he was not only present but he was instrumental in having the vestments hand made in the Philippines. Redemptorist Father Donald Miniscalco, who knew Msgr. Tomichek through equally long association with St. Peter’s, will preach at the Friday evening Mass. “He insisted it not be a eulogy. He told me only to preach on Jesus,” Father Miniscalco said. Msgr. Tomichek’s funeral Mass will be celebrated at 10:30 a.m. Saturday, April 5. Bishop Herbert Bevard of the Virgin Islands, who is a friend from St. Charles Seminary days, will be the principal celebrant. The homilist will be the Redemptorist Provincial, Father Kevin Moley, who is a former pastor of St. Peter the Apostle. Because Msgr. Tomichek was also a Third Order Redemptorist, burial will be among the Redemptorists at Holy Redeemer Cemetery, Philadelphia. Msgr. Tomichek leaves no immediate survivors.